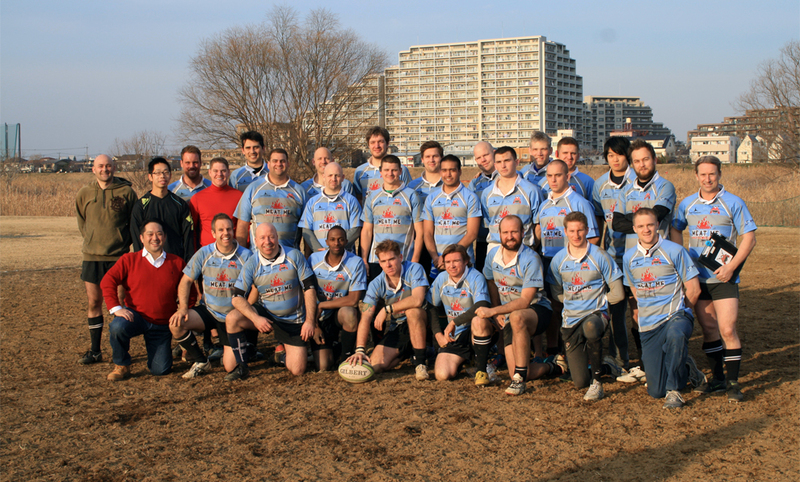 After a gutsy 33-17 win over Fuji RFC, our post-season march to Division 1 rumbles on for another week. Tooley’s clever ploy of not telling us the kick off time seemed to work as 25+ guys were ready and waiting at Yanokuchi Station two hours before kick off, which meant we were able to have an excellent warm up and practice, and be ready for the match fully prepared. Which was just as well, because the game started at a very fast pace and hardly relented all game. The Cru had the upper hand with the majority of possession and territory, but it took us until the 22nd minute to cross the try line. With a scrum 5 m out, we very nearly got there with a push over before No.8, Tom Ball, made his signature run off the back and crashed over for our well deserved first points. Captain Evan duly converted. Tom’s try got us going as Yorkie and Travis both scored impressive tries from long range runs, with Yorkie unfortunately being too fast for his own good and picking up a hamstring injury along with his five-pointer. Evan’s fine kicking had us out to a 21-0 lead after half an hour gone, which is how the score remained for the rest of the half. Fuji managed to get on the scoreboard within minutes of the second half re-start after a loose lineout let their prop dubiously squeeze in over the line right in the corner. It was a high scoring half in fact, with five tries scored in total. Travis responded brilliantly for the Crusaders minutes later with his second try of the day after waltzing through gaps that even Fred Astaire would have had trouble with. For almost the next 15 minutes, no further points were scored as both teams tired each other out with endless scrums after the ref had some curious rule interpretations at the breakdown. However, we were happy to take the scrums as we didn’t lose one all day and never took a backwards step. Every forward put in a massive effort at scrum time, and this is where we won the game undoubtedly. Fuji snuck in two quick tries within a couple of minutes, before Sean Gibson ensured a Crusaders win after his industrious support play gave him a try five minutes from time. Both teams looked relieved to hear the final whistle, everyone was out on their feet after a cracking game had been played! With Tooley having already sniffed out another good watering hole, that’s where we headed to celebrate our win. We’d done ourselves proud, and the mood while drinking really showed that. A huge thank you to the seven new lads who showed up: Wyn Hughes, Eric Wercholuk, Patrick Murray, Nester Gonzalez, Andrew Grachek, Jordan Dill and Evan Kerr, who almost had a dream debut by diving over for a try only to look up and see that the try line had moved by a foot or so! Big thanks also to Yutaka Yuzawa and Yutaka Negishi for sideline duties and turning out to support while injured. One more game….then Division 1 awaits us.